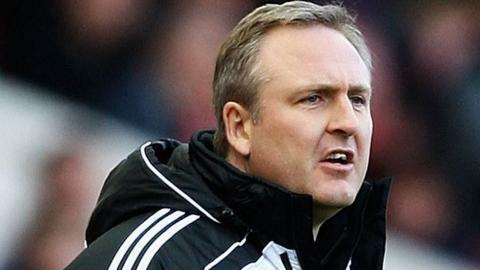 Coventry City manager Tony Mowbray has brought in his long-time managerial assistant Mark Venus as the League One club's new technical director. He has also made a further alteration to his backroom team by appointing Jamie Clapham as coach. Venus, 48, has worked under Mowbray at all four previous clubs he has managed, Hibernian, Celtic, West Bromwich Albion and Middlesbrough. Clapham, 39, was also part of Mowbray's backroom team at Boro. He will assist with the first team and the Under-21s, while Venus will be in charge of recruitment. Mark Venus and Jamie Clapham are both former team-mates of Coventry City boss Tony Mowbray from his days with Ipswich Town. Venus, who began his career at home-town club Hartlepool, played for Leicester City, Wolves, Ipswich and Cambridge before finishing at Hibernian. Clapham, who started at Tottenham, spent the majority of his career with four clubs - Ipswich Town, Birmingham City, Wolves and Notts County. He first linked up again with Mowbray in a coaching role at Middlesbrough. Neil MacFarlane, who stayed on as assistant manager following Steven Pressley's sacking in February, will remain in his existing role. "Mark is someone I've worked with for many years and have enjoyed a lot of success with," said Mowbray, who signed a two-year deal last month. "Jamie impressed me with his coaching skills and development during my time at Middlesbrough. "Throughout my discussions with the club's owners and the board, the main areas I highlighted were structure and recruitment at the club. "If we're going to achieve our ambitions, it is important not to just focus on the pitch but also the work we do off it. If you look at the work I did at Middlesbrough and West Bromwich Albion, there is now a successful structure in place at those clubs and this is what I want to replicate here."